Did steam or wind propeller these 19th Century vessels? What were their favorite Southern ports? Where did they sail? What if they were captured? Who owned the blockade runners? I usually think of 19th Century ships as sailing vessels. Many were. 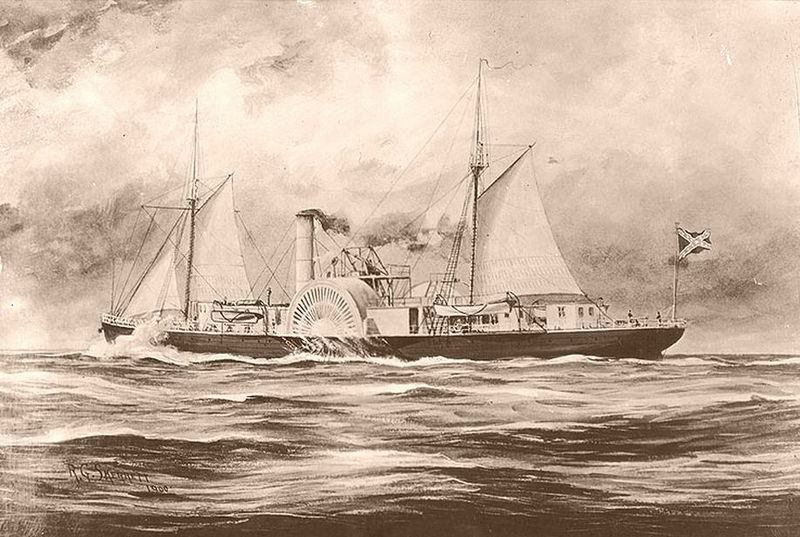 But by the mid-19th Century, steam powered vessels were crossing the Atlantic and sailing the coastlines regularly. They were more reliable (typically) than the sailing ships which relied on favorable winds for their movement. 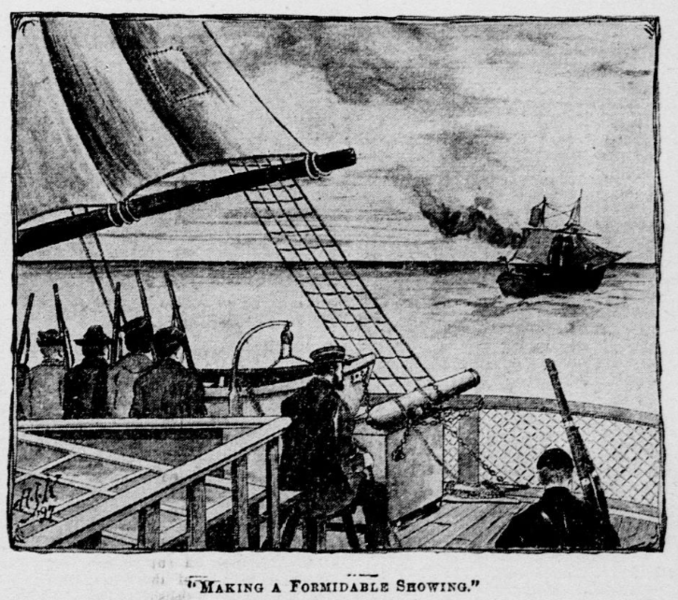 Steam powered ships could keep a schedule – allowing passengers and mail to arrive at destinations regularly. They could get to their points of entry or exit of the blockade at favorable times (ideally). Yes, most blockade runners still carried sails, but steam was their main means of movement through the waters. Just about any Southern Port with a good harbor still in Confederate hands welcomed, sheltered, and outfitted blockade runners. The number of ships sent out or returning to a port depending on the military situation in the area. 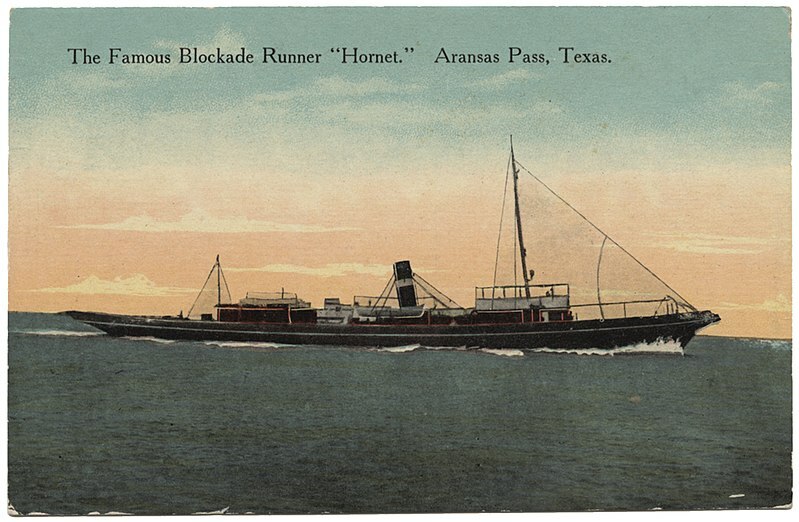 Some of the most famous ports for blockade runners were Wilmington (North Carolina), Charleston (South Carolina), Savannah (Georgia), St. Mark’s Port (Florida), New Orleans (Louisiana), and Galveston (Texas). New Orleans was captured by Union forces in the spring of 1862, a major blow to the supplies entering the Confederacy through that port. Other port cities followed. By the end of 1864, Wilmington (North Carolina) was the last major port city still held by the Confederates and open for blockade runners; however, with the capture of Fort Fisher early in 1865, Wilmington was captured and the days of the blockade runners came to an inglorious and unofficial close. Where did the blockade runners go with their cargo of cotton after slipping out of the ports and passing any patrolling Union ships? It depends. We usually imagine the majority sailing to Europe (does Gone With The Wind influence this idea? More on that another time). However, look at a map. It’s a much shorter voyage to the West Indies or Bahamas. If the goal of a blockade runner was 1) make money and 2) bring lots of supplies, then the owners, captains, and crews want to make a quick trip and as many trips as possible in a year. So…many blockade runners went to the islands, exchanged the cotton for European made goods previously brought to the islands by less sneaky vessels, and then headed back to the Southern ports. Yes, some blockade runners did make the voyages to Europe. Again, they carried cotton to exchange for food, luxury items, weapons, and medical supplies for the Confederacy. There could be advantages to trading direct in Europe. Each ship’s course had a reason, set by the owners and the captains to fulfill immediate needs…and make a profit. What happened if a blockade runner got captured by a Union patrol ship? Well, first off, the blockade runner’s crew wouldn’t fight. They were merchant men (nevermind who they supported). So there would be no “run out the cannons” scenes; however, the Union ship might fire some warning shots at the ship. A blockade runner wanted to evade capture – obviously. A game of wits often ensued as the captains of the different ships tried to outsmart and outmaneuver each other. If the ship was captured, the supplies were confiscated, but the civilian crew was supposed to go free. Oh well! They could get another ship and be back in the trade within a few weeks – if they wanted. Ship ownership is an interesting topic with blockade runners. Some were owned by businessmen looking to make a profit from the war. Some were sort of joint venture ownership from businessmen or civilians – again usually trying to make some money. Sometimes Confederate states funded blockade runners to bring supplies for their troops and civilians. Others were technically owned by the Confederate government. Now, just because they were owned by the Confederate government or states does NOT mean they were warships. I’ll repeat: blockade runners were unarmed merchant vessels. But funding from states, the Confederate Ordanance Bureau, or the Confederate Navy Department was sent to Europe to build or outfit blockade runners. Then those ships would serve those organizations and help fight the logistic battles of the Civil War. In this case, the logistic battles were shotless and usually bloodless – just a fight for the fastest ships, smartest captains, and bravest crews (and a lot of luck! ).